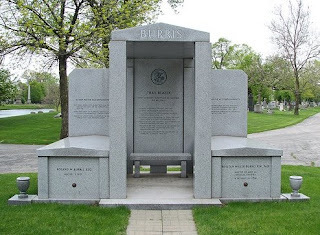 Lake County Eye: New Senator already has a tomb? Roland Burris is already planning ahead? I thought this was photo shopped at first but apparerntly not! Amazing! I wonder how much it will cost him to add United States Senator to the wall. What a joke...I saw this and thought it was a joke as well. I am guessing his spouse preceded him into the tomb! A lot of people pre-purchase their cemetery plots and headstones, especially if a spouse or child has preceded them in death.